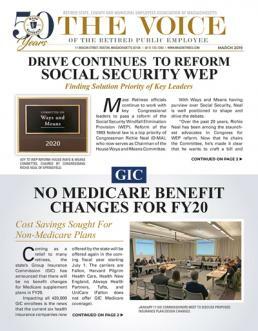 MAY 2015 VOICE: Efforts to advance federal legislation reforming the Social Security Windfall Elimination Provision (WEP) continue in earnest. Led by Congressmen Richard Neal (D-MA) and Kevin Brady (R-TX), HR711 has gained traction within the US House of Representatives. MAY 2015 VOICE: After five-years of low cost growth and medical inflation, retiree costs with the state’s Group Insurance Commission (GIC) are set to jump come July 1, 2015. The sharp increase in what some retirees will be forced to pay for healthcare has resulted in an Association legislative proposal seeking to lower the cap on out-of-pocket costs. MAY 2015 VOICE: Last year the Association began exploring the possibility of offering discount programs to members. Our first such program, a discounted BJ’s Wholesale Club membership, was unveiled in December and proved a great success. Since then, we’ve listened to the requests of members and have worked to develop new programs. MAY 2015 VOICE: In his first budget proposal, Governor Charlie Baker has proposed a full 3% COLA for state and teacher retirees to be paid beginning in July on the existing $13,000 base. Baker is the first Republican governor since Jane Swift to support retiree COLAs. Former Governor Mitt Romney failed to provide for a retiree COLA in each of his four annual budget proposals. MAY 2015 VOICE: For those members with insurance needs outside of Massachusetts, the Association is now in the process of establishing a similar discount program with national insurance providers.